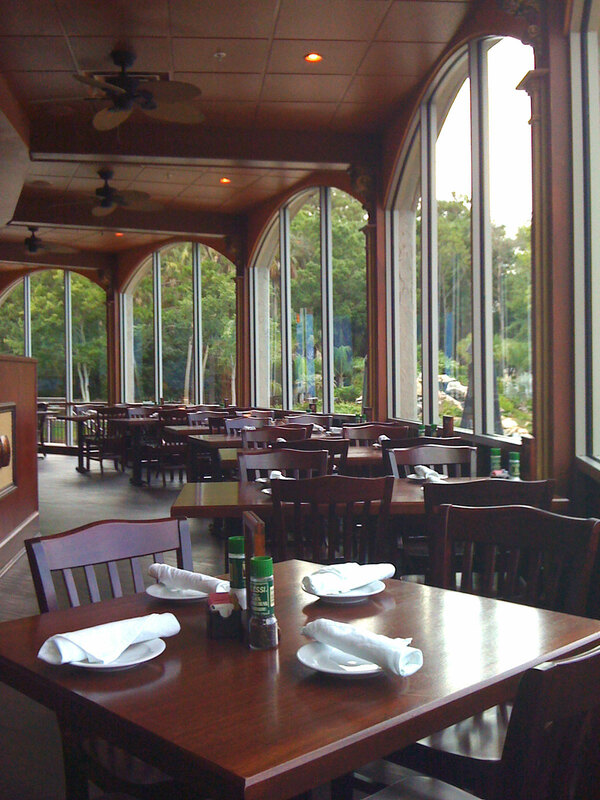 Pusser's Bar and Grille has been holding down a prime corner location in the "Shoppes of Veranda" (aka next door to Ruth's Chris Steak House) in Ponte Vedra for a couple of years now. If you haven't been, what's keeping you? A great location, friendly, attentive service, and the best rum concoctions this side of the Caribbean await! Oh, and there's the food, but that's not what I think of when I think of Pusser's. We're blessed in this region with some fantastic seafood, a wealth of independent restaurant operators with unique perspectives, and some simply good places to kick back and raise a wrist. For me, Pusser's falls into the latter category. 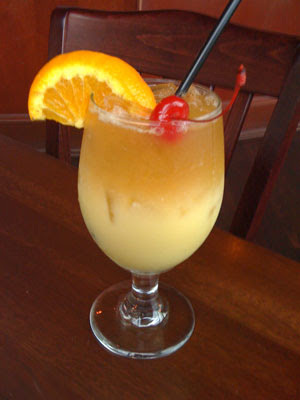 I'm ok with dropping some bucks on a frozen rum concoction to sip while downing a plate of coconut shrimp, but it turns out not all my friends are so inclined. Few of them have been to Pusser's. Another of my "not so scientific" polls revealed that the number one reason for that fact was, well, the NAME Pusser's. It reminds people of something... less than appetizing. My personal frame of reference is shaped by an ex-Royal Navy Liverpudlian-turned-Canadian I dated several years ago while living in Cincinnati. He was mad for a grog made from Pusser's Rum, which is, in fact, quite good. When Pusser's management invited me to re-visit their Ponte Vedra restaurant, I was skeptical. After all, I panned it last year during the 2009 Taqueria Tour. Had anything changed since then? A sneak peak at their new menu, and a stipend of fifty dollars (in the interest of full disclosure) to defray the cost of my explorations convinced me to take another look. 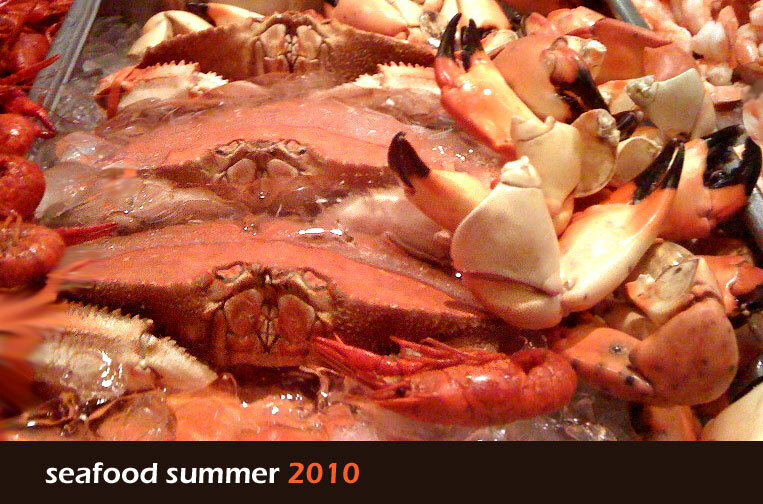 So without further ado, and in the name of Seafood Summer, let's talk seafood! 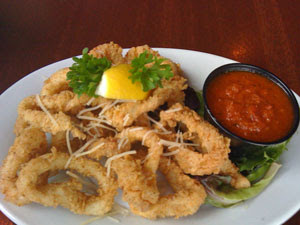 First up - this starter from Pusser's bar menu - Fried Calamari, served with house-made Marinara ($8.50) can be had for half-price during "Half Off Happy Hour" Monday - Friday 3-7 p.m.
Not much you can say about Calamari - this rendition was good - tender, crispy breading, large rings. I didn't taste the Marinara, I'm more of a lemon and tartar girl when it comes to fried seafood. These are also half-price during happy hour, and worth returning for. You can get them served Fra Diavolo but our server wisely informed us theirs was a tomato based version, which, again, not a fan of. LOVE the spicy, just not the tomato sauce. Good call, friendly waitress person! This is as good a time as any to point out that - in my humble opinion - the number one asset of Pusser's is not the great location, or the rum, or the food - it is the service staff. Everyone we've encountered has been friendly, helpful, knowledgeable and efficient. They have a knack for making you feel welcome and comfortable. They truly seem to be enjoying their jobs, which is a plus. Kudos to the entire front of the house staff. 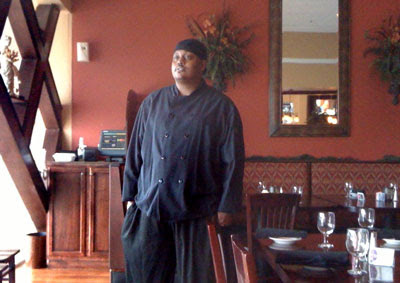 I should mention that most of our visits were incognito - it was only the last time we attended that our cover was blown - as our patron wanted me to meet General Manager Dan Monk, and Executive Chef (and Ponte Vedra native) Chris Delay. Both men made a stop at our table to greet us, and were equally friendly and knowledgeable. Chef Delay came to table while we were sampling our entrees. 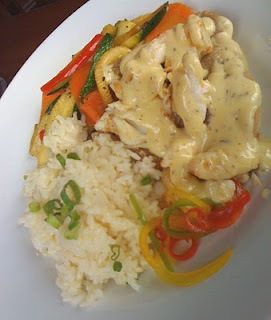 Grouper Ponte Vedra is a pan-seared grouper (Red Grouper, he informed us) topped with a generous portion of sauteed jumbo lump crabmeat and béarnaise, served with fresh vegetables and tropical sticky rice. ($24.50) Portion sizes are generous here. The crab was the star of this show. My Grouper was in little grey pieces, from the small end of the filet, and was all but lost under that mound of sweet jumbo lump crab. The sauce was rich and thick, and there was rather a lot of it. Vegetable medley was standard fare. Their sticky rice is a bit sweet - its a Caribbean thing - but I'm not overly enthusiastic. In this case it was a good pairing with the rich sauce and sweet crab, but again, the humble Grouper was lost in translation. She enjoyed the straightforward presentation, and the abundant fish and shellfish. The bits I tasted were nicely done. 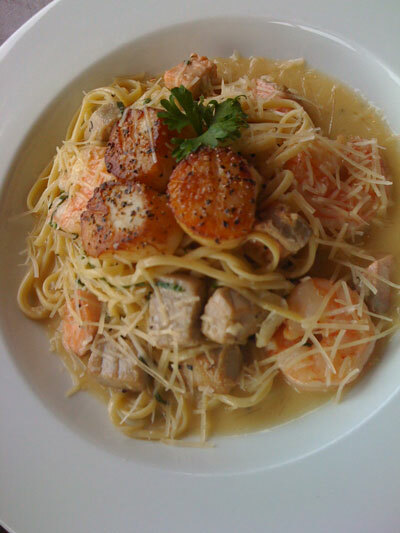 Big, beautiful shrimp and scallops and at least two varieties of fish made this a most enjoyable choice. 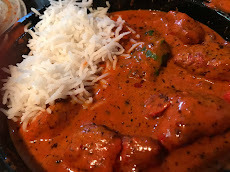 The sauce was a rich and flavorful enhancement to the dish. While the food on these visits was better than my previous trips, I am still convinced that the real beauty of Pusser's is in the drinks. $2.50 Red Stripe all day, every day, and a lineup of frozen concoctions that would knock any parrot head off their perch. There's an indoor bar and an upper deck bar called the "Upper Deck." They can accommodate large groups and special requests. On one recent Saturday there was a charitable event for over 100 young professionals being hosted on the Upper Deck - complete with an old fashioned low-country boil. Our drink of choice is the Painkiller - sweet and spicy - but beware - it packs a punch! If we're coming back, its because of that. And to try the Coconut Shrimp, of course. The usual clientele of the restaurant is multi-generational, although I haven't seen too many children there, and dress is anything from date night finery to beach casual. Pusser's Bar and Grille is located in the Shoppes of Veranda, across from Ruth's Chris steakhouse. There is complimentary valet parking in the evenings, and a covered parking garage available. Open daily for lunch and dinner starting at 11am and for Sunday Brunch from 10am-2pm. They say imitation is the sincerest form of flattery. Well prepare to witness some fine flattery, my friends. 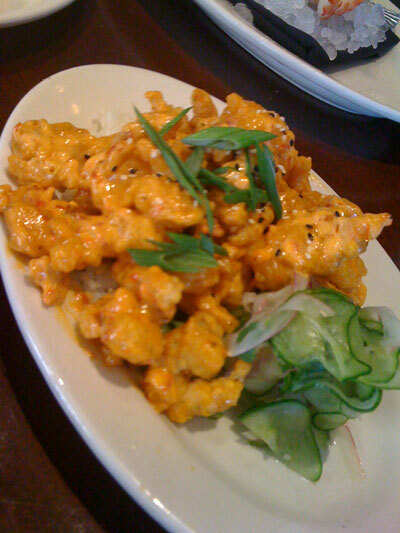 Bang Bang, Spicy Asian, Bing Bang, Bangin' Firecracker Shrimp. At the heart of this dish is the lovely shrimp. Sweet, tender, slightly chewy. 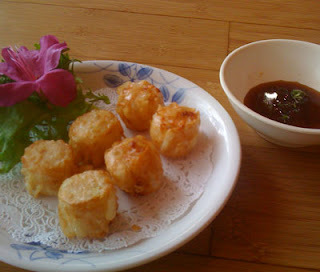 Battered or coated, fried, then lightly sauced with a creamy, sweet, hot Thai Chile inspired sauce. So now you've got sweet, creamy, hot, chewy, salty, crunchy goodness, piled in a dish or on the plate. Simple, yes, but insanely addictive. Thus all the imitation (er, flattery) cropping up all around town. Let's start with the original. 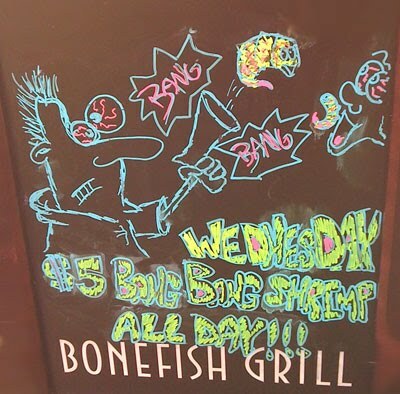 To the best of our knowledge (or at least what we were able to turn up by Googling it), Bonefish Grill is the OG of the Bang Bang Shrimp craze. Or should we say Original Bangsta! A sweet, spicy, crunchy, chewy, creamy pile of shrimp, garnished with scallion tops and brought steamy hot to your table with a set of chopsticks. Everyone watches as the waiter navigates through the room with this dish, and then its like a chain reaction - ooohhh - I want THAT! We love Bang Bang Shrimp. So much so, we hardly ever eat anything else at Bonefish. 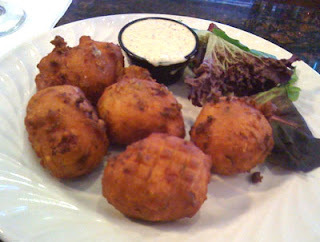 A couple of Sidecars and some Bang Bang Shrimp, a rockin' Crabcake app, and you've got the makings of a great evening. But I digress. This is all about the Bang Bang. Lovers of the original can rejoice in the fact that you can get them for $5 (discounted from the usual $9) on Wednesdays. As we made our way around town we felt compelled to compare the Bang Bang Shrimp from Bonefish Grill to the rest of the Bangin' crew. So we set out to perform a VERY unofficial taste test. 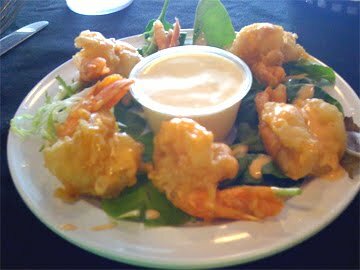 First up - Firecracker Shrimp - from Pusser's Bar and Grille in Ponte Vedra. WAIT - it gets better! MONDAY is $4 Firecracker Day - so save that quarter for the soda machine at work. Wash 'em down with a Red Stripe - $2.50 all day, every day! We have recently changed our opinion of Pusser's, thanks to a personal invitation from their new marketing manager (accompanied by a $50 gift certificate to defray the cost of our tastings there). While we spent more than that on drinks alone during our explorations, we were for the most part pleased with what we found. A new menu was released last week, and we'll be posting on that shortly as well. But for the purposes of this post - we can say without prejudice that their Firecracker Shrimp was a pretty good representative of the category. 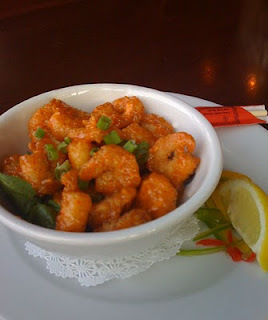 Then there's the craftily named Bing Bang Shrimp at Crazy Fish in Jax Beach. Yeah, they are not fooling anyone with THAT name. Described on their menu as "jumbo crispy fried shrimp covered in our sweet island tropical sauce" - these were more sweet than spicy, more crunchy than anything. 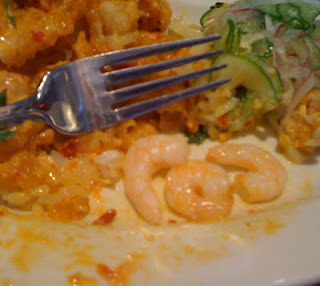 The shrimp themselves were nicely done, but because they are larger, the portion seems smaller. Not as easily shared as most of the others. They dress out the plate with some chunks of melon (to tame the heat which never quite came on) and a huge hush puppy (aka waste of space onion studded ball of dough). Seriously, people, what on earth is the deal with Hush Puppies? Leave these for the howling dogs. Focus on the good stuff. Next up is another oddly presented contender - from Jackson's in Riverside - Blazin' Shrimp ($6) are reported to be seasoned Buffalo wing-style shrimp with a dipping sauce. Six large shrimp for - you do the math - a buck a piece. Again, the individual shrimp were delish - but you won't want to share. 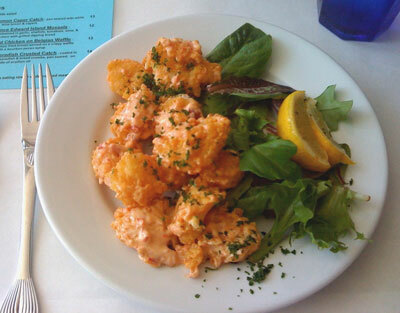 Our favorite of the Bang Bang Wannabe Gang was the Sock it to me Shrimp appetizer at The Blue Fish in Avondale - $6 on the lunch menu, $11 at dinner or on the bar menu. (We went at lunch - and it was a great bargain). The portion was generous on this day - enough to share or have as a meal. 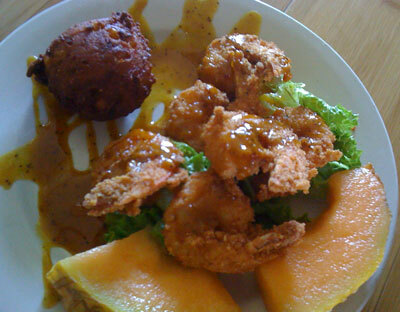 The juicy shrimp were nicely breaded and fried, served piping hot with a coating of creamy Thai spiced sauce. The assertive heat stayed around after the dish was cleared. I'm thinking these were panko crusted - but I'm going to ask the server next time because they were my favorite in the coating category. 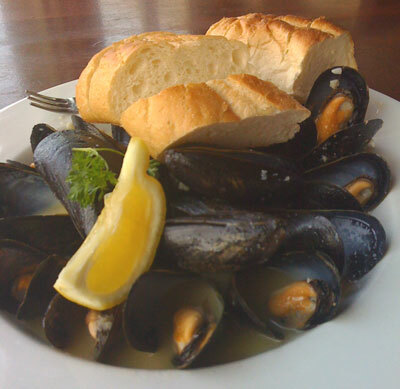 The light, crispy texture and the generous portion size have propelled this dish to the top of our lunch craving list. Sure, you could share, but you won't want to! Drizzle some of that lemon and dig in! One of the biggest disappointments in the search for the perfect faux Bang Bang was this gloppy mess from Mitchell's Fish Market in St Johns Town Center. Spicy Asian Shrimp came with sweet sticky rice, pickled cucumbers for a whopping $9.95. WAY too much money for WAY too much sauce covering WAY too small, WAY over-breaded shrimp. The flavors were good - the spicy heat was there - but the textures were just wrong. And instead of a nice medium sized shrimp, these were tiny - almost salad sized, and not butterflied. The breading expanded when they cooked, so most of what was on that plate was breading, sauce, and air. 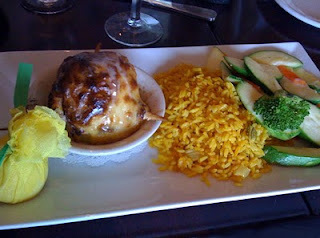 The rice was nice, but mostly it was there to elevate the shrimp so the portion would look larger. The pickled cucumbers were soggy and limp. We tried the crab cake too - do NOT even get me started. Stick with the Kung Pao Calamari if you want a great fried seafood app at Mitchell's. Speaking of alternatives - we couldn't let the Asian Shrimp app category go by without singing the praises of this delicious offering from Fuji Japanese Restaurant on Roosevelt Ave.
Shu Mai are tender, sweet shrimp dumplings - a bargain at $4.50. If you drizzled a little shrimp sauce on them you'd have a Bangin' good replica - but don't - they are melt-in-your-mouth perfection with the accompanying dipping sauce. 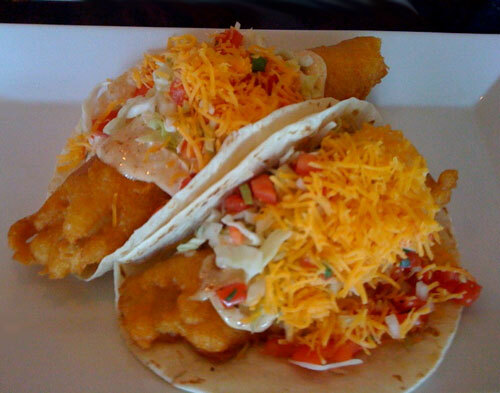 Another controversial entry in the Bangin' category is the Bangin' Shrimp Taco $2.95 at Jax Beach fave rave Tacolu. EVERYBODY raves about the Bangin' Shrimp Taco - everybody except me, it seems. My verdict - too sweet. 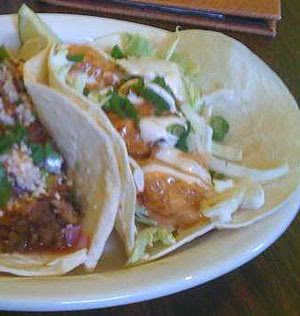 The shrimp (about 3 to a taco) tasted like they've been candied. Hot, sure, sweet, hellz yeah. Yet somehow it doesn't work for me. Don't get me wrong - We LOVE The Lu! But the Bangin' is the one taco on their menu I don't really much care for. 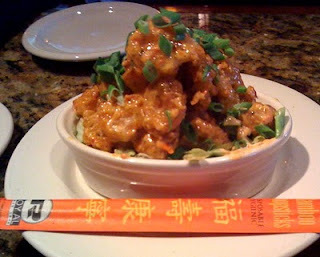 Bang Bang Shrimp from Bonefish Grill - can't say there's nothing like it, but we're sticking with the original. Well, we sampled as many as we could find, but I'm sure we've left out some of your favorites - so if you know of another Bangin' Slammin' Rockin' Sockin' Asian Fried Shrimp Appetizer in town, please let us know! In the interest of full diclosure - the fine folks whose work it is to promote the Bonefish Grill have asked us to compare them to another local seafood restaurant - and this time they've put their money where our mouths are - with a generous donation to the Beastie's dining fund! We'll be drawing those comparisons soon in another post. 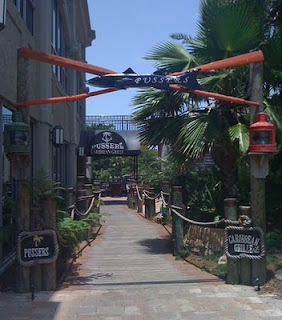 Thanks to both Pusser's and Bonefish Grill for helping to make this the best seafood summer EVAH! Nothing better on a scalding summer day than a bowl of gazpacho and a lovely piece of snapper! Executive Chef Ted Peters of Azurea at One Ocean Resort in Atlantic Beach is sharing a few of his culinary secrets with a Mediterranean Cooking Series, Sunday, August 15, 2010. Twelve lucky foodies will enjoy the interactive class for $60 per person. Beginning at 1:00 p.m., participants will enjoy champagne and canapés while they meet the chef and staff and hear the course of events for the class. After receiving an apron, hat and menu packet, chef Peters will help them create a summer meal from Mediterranean ingredients. Once the four-course meal is prepared, future chefs will enjoy wine pairings with each course. The afternoon is wrapped up with a take-home of a chef’s jacket and apron along with the day’s creations at 3:00 p.m.
With 17 years of experience in fine dining, Chef Peters has made a name for himself hosting wine festivals, appearing on distinguished committees and judging panels, as well as immersing himself in local charities. 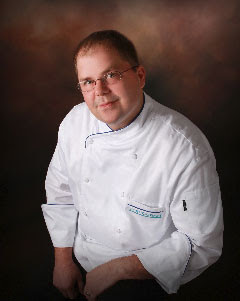 Most recently he was invited to cook at the prestigious James Beard House in NYC. The Daily Deal is a coupon / sales incentive program from Jacksonville.com - featuring great deals on goods and services from local merchants. Recently they featured a restaurant we'd been wanting to try, so when they dangled the line with $24 for $50 worth of seafood at The Crabcake Factory in Jacksonville Beach, we took the bait. Three generations of beach babes rolled into the place during a Thursday lunch service.We were sorry to see the dining room was empty, but that meant we had our choice of seats. We asked our hostess for a table in the lightest area possible. She led us into the deserted dining room, and passing at least three tables that would have done nicely, proceeded to steer us to the darkest back corner of the room. While she seemed confused, we just made ourselves at home near the window. 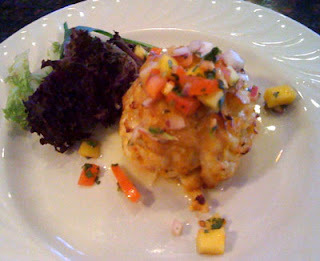 The Crabcake Factory features Maryland Blue Crab - billing it as "Incredible Seafood in a Fine Atmosphere." 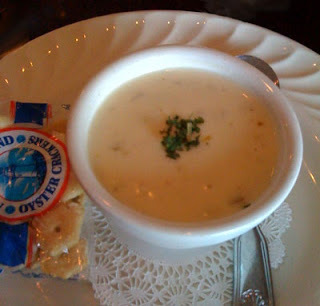 The best dish to grace our table was the simplest of starters - the Cream of Crab soup was delicate, sweet and buttery, with just the right consistency - not too gloppy or soupy. 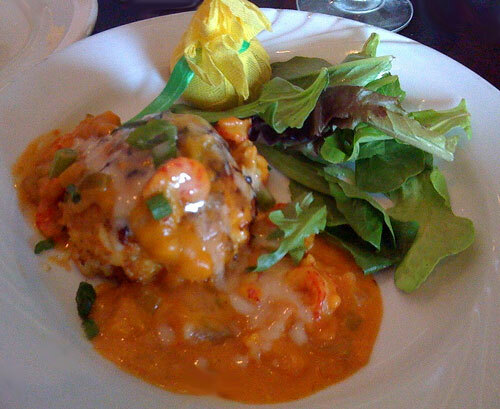 The sweet blue crab was showcased perfectly in this dish. If only we would have stopped there. But we had fifty dollars to spend, so we ordered up and waited for our next course to arrive. Caribbean Conch Fritters served with jerk key lime sauce (8.95) were massive, dense balls of fried dough with a few shards of rubbery conch scattered inside. A let down after that lovely soup. It was light and sunny creation, with plenty of crab and sweet mango, lightly sauced, and with a glass of white wine it was the perfect afternoon snack. I have to admit, the crawfish lured me in. But what I found at the other end of that hook was a gelatinous glop of shiny, over-seasoned dayglo orange goo, which completely overpowered the sweet tender crab in the generously portioned cake. Good crawfish though. Unfortunately, there was no getting past that thick, orange beer batter. Once cooked it was more like two thin strips of fish encased in a savory deep-fried muffin. She politely picked at it, but was happy to have ordered a side salad so she at least had some sustenance. Our other two diners ordered the same entree. Seafood Imperial - scallops, shrimp, crab claw fingers stuffed with lump crab imperial glazed with a lemon butter Chardonnay sauce. (9.95) - presents as a mound of creamed seafood and stuffing buried under a dome of broiled glaze with blue crab claw tips poking out at the corners. Not knowing quite how to approach the dish, the matriarch of the family pulled out one of the delicate little crab claws and started to pull the meat off with her teeth. In a flash she spat out the crab and began moaning, desperately wiping her tongue with a napkin, washing out her mouth with water from a nearby glass. When she could speak, she informed us the little crab claw was rotten. "Smell this" she asked. I dutifully obliged and met with a whiff of the most rancid, putrid, disgusting thing I've EVER smelled in a restaurant, period. Fearing for her safety, we stopped the other diner from eating her meal. She plucked out the crab claws, and cautiously sniffed each one. No problem. She began tentatively nibbling away at it, but I can only imagine her enthusiasm was lessened. When our waiter finally emerged, we asked him to remove the rotten dish. He apologized for our trouble and whisked it back to the kitchen immediately, without asking could he bring something else in its place. Now there were four hungry diners, three not so appetizing entrees, and one person sitting with no food at all. Another ten minutes went by before we saw our waiter again. We waved him over (which we had to do despite the fact there was only one other table seated in the entire room) and suggested our diner might want something to eat. "Oh, sure, what can I get you" he asked. She wasn't sure she wanted anything at all, since whatever would be brought out clearly wouldn't get here before we were finished with our meals. The waiter said, "well, I did ask the chef to fire up another Imperial for you, and put a rush on it. Let me go check on that for you" he offered generously. Another ten minutes ticked by before the replacement meal arrived. Then we were three diners sitting in front of picked over plates, while our matriarch was left to dig in and finish her meal. She noted the temperature of the dish was quite uneven - with some pieces being cold and others quite hot. Accompanying veggies were basically raw. She dug out a whole scallop and shrimp, ate them both, and took a couple polite bites of the imperial mixture, just enough to curb her hunger, before throwing in the napkin. In an ironic twist, as we were waiting for our check to arrive, the chef emerged from the kitchen - not to ask how our meal was or apologize for the rancid crab, but to have his picture taken! I snapped this one with my cell phone while the photographer was snapping away. I didn't ask his name. When we walked out, a CCF employee asked the matriarch how everything was. Big mistake. "It was awful. I was served rotten food. This was possibly the worst dining experience of my life" she answered honestly. "Oh my gosh! I'm sorry! What happened?" She looked to me for explanation. "She was served rotten food," I replied. "I'm sorry that happened to you. Did the waiter bring you a replacement?" "Yes. We had already finished our meals by then though." I'm thinking the waiter could have let management know this had happened, so someone other than our waiter could have come to the table and apologized to our 72 year old matriarch. We worried that she might suffer ill effects from coming in such close contact with rotted seafood, but she has a stout constitution and was just fine. We took the edge off the event with some fro-yo dessert at nearby Mr. Yogato. Their website promises "you’ll have a fun-filled and delicious dining experience!" On this day, they did not deliver on that promise. We won't be punching in at the Crab Cake Factory again.